girish: The Disenchantments of "La La Land"
Wonderful, Girish. I wasn't sure why the movie left me so cold but this helps me see there are even more reasons to dislike it than the ones I had. One major beef of mine was that Sebastien's "theme" wasn't remotely jazz-like. 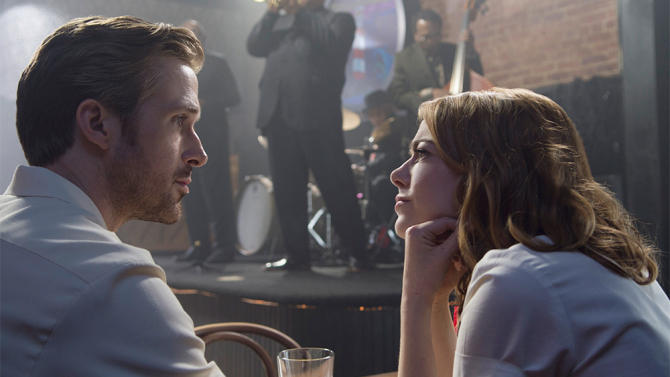 I also felt dismay when Emma Stone's character asks Gosling, "Jazz, like Kenny G?" It made her seem so clueless I couldn't even like her. That's a line you give a total dumbass. While I greatly enjoyed both Moonlight and Manchester by the Sea, my favorite of the year continues to be Damien Chazelle's La La Land. If forced to come up with a reason why, beyond contingencies like seeing the movie in the cinema as opposed to an online screener, I believe, strangely, that it may have something to do with its weakness as drama. La La Land really only works as cinema, and announces its unreality right away, existing in a very different space than the realist drama. In other words, it is very close to the metaphorical pole, especially in its structural similarities to the Broadway musical (see David Bordwell's detailed discussion here). It is the pure cinematic verve of Chazelle, and the movie's lack of reality, that I love, although even this film has long stretches where it shifts to the metonymic pole, such is the pull of realism in the cinema. This leads to a greater backlash (Chazelle is trying too hard, all style/no substance, etc), and in the era of Trump, Hollywood may decide to honor a more socially conscious drama like Moonlight over a movie that celebrates Hollywood itself (which it normally loves to do, of course). But despite the emotional impact of the heavy drama in Moonlight and Manchester by the Sea, La La Land was able to create a similar impact with much lower stakes, which leads me to value its artistic achievement more. "Not all movies are equally stimulating for critics to write about – either for or against – but La La Land has ignited a remarkable number and range of responses." Don't you think your piece would be more interesting if you followed up on the above thought, that is, essaying how a film can be received in such contrary ways? Instead, you simply quote people who you take as agreeing with you. I also wonder if Emma Stone or John Legend agree with what some people say about their characters. I suspect not, just as I suspect many spectators don't agree with the interpretations you quote. But it's all opinion. Why not explore the reasons for the difference in opinion. Ken Eisner's two cents: "As he proved with his hit Whiplash, young writer-director Damien Chazelle has tremendous enthusiasm for genres he poorly understands. That drumtacular tale posited jazz as a solo act, built around a player who treats art like an Olympic competition. Despite the whimsical title, La La Land is similarly calisthenic, and now the strain is spread over elaborate dance duets, large-ensemble choreography, and both mechanical and digital special effects—all in Los Angeles settings recalling other, far better movies. The dude sure can spend money!" If I think this out some more, many of the objections Girish makes pertaining to race, individualism and nostalgia that are present in "La La Land" have been juxtaposed albeit in an overly simplistic and sentimentalized way in another film receiving much critical and popular love, "Hidden Figures." It is admirable that "Hidden Figures" attempts to counteract the racial and misogynistic stereotypes put forth in most mainstream studio products with a "good" message but a message it is nonetheless and the film lacks the conflict, divisions and inherent contradictions that are an endemic to any work of art. I realize the piece is about "La La Land" but I felt compelled to comment on it's apparent antidote which is "Hidden Figures" and is not an antidote at all but rather a condescending perpetuation of White Liberal Hollywood memes. I really appreciate this piece, particularly for how it extends the analysis of Chazelle's white knights of jazz. The consistent silencing/lack of black voices in his films is quite troubling, particularly as he makes films that supposedly champion jazz as an art form. Thanks for this post, Girish! I have only recently discovered your blog, and I am very grateful it exists! "Everyone, myself included, got this post-musical wrong by comparing it to Jacques Demy when it’s thematically and emotionally much closer to John Cassavetes’ Too Late Blues — and perhaps even more traumatized in its meditations on the costs of “success” and “selling out” by virtue of its would-be “happy ending." I saw how the essence of this film, as in Too Late Blues, is "compromise." Rather than read the narrative vulgarities (the "whitemansplaining," the individualistic view of jazz, the racial diversity, the sick-headed nostalgia) as completely un-self-conscious byproducts from the filmmaker, I see them as subtly and constructively undermining themselves. The compromise is how La La Land can be sustain a reading both as a frivolous musical hit about making it big and winning/love can’t always turn out what you want it to be, etc. — and, as a self-conscious entity that critiques the very flattening flaws that helped make it a mass success. The aggressive touch Fernando aptly talks of ("Swoon, goddammit, swoon!") seemed a conscious effect, used in the service of "manic depressiveness" — the desperate need to maintain an air of gaiety, lightness, and happiness that is patently false. I found it a smart work about narcissism and self-absorption, and how this individualistic drive is the ultimate key to success—perhaps even more so than the harmonizing work of an ensemble. It’s an utterly cynical position to take, and I don’t think Chazelle believes it to its logical extreme; but there’s some truth to that thesis that he recognizes, so he uses it as a starting point for an exploration into questions of honesty, authenticity, and personal versus social identity. It's more honest than most works in emphasizing that basic human (peculiarly American?) instinct for selfishness — every person for themselves — success at the cost of a working ensemble. When Gosling talks about how jazz is about the ensemble then acts in a mostly individualistic manner, it doesn’t seem to me like the film is taking up his position; it is a stealth critique of it, simply by showing how the action does not line up with the ideal. Everything makes you aware of the characters’ individualistic bent; it doesn’t try to hide it, it doesn’t celebrate it. The increasingly un-peopled musical numbers. The narcissist's greens. The blurring camera motions which twirl around and around, focusing on nobody except when it finally lands on the two leads. The sheer lack of faith Seb and Mia have in the ensemble: at one point, Mia’s friends explicitly ask her, “So you’re going to include us in your play, right?” She answers, “No, it’s a one-woman show.” Seb needs to save jazz by himself — and only succeeds at building a small ritzy jazz club somewhere in the upscale part of Hollywood, narcissistically named after himself, but whose books are really managed and run by a black man! Seb and Mia's sin is the sin of self-enclosure, of being so wrapped up in their own fantasy worlds that they forget the roving, diverse reality around them. When they nod to each other at the end, it didn’t seem to me an acknowledgment that they got everything they wanted, that they are "successful" emotionally or spiritually; rather, it is a manic-depressive, defeated gesture that acknowledges how much they now realize the limits of idealism, the limits of fantasy, their realization that they pushed each other by working together, but ironically into even more self-enclosed bubbles of privilege, self-realization, and selfish success. It’s this quality that makes me understand why Rosenbaum calls it “even more traumatized.” I don’t think Chazelle is for it, of course; but he creates a work that feels like the manifestation of all his fears and insecurities as a 25-year-old: Am I genuine? When I say I like to work with people, do I really mean it? Am I too wrapped up in a bubble? etc., etc. And re: the film holding up Seb as "white savior of jazz" — I don’t quite see it. Nothing in the film's grammar tells us that that’s even a viable position. He's too unwilling respond to changing tempos (that whole exchange with John Legend, which was apparently suggested by Legend himself — the power of the ensemble!!). In the most telling shot of the film, the camera starts with the black jazz ensemble in focus, then slowly tracks back to the white couple foregrounded, listening in on them and talking over the black musicians, who are now out-of-focus. It seems a moment of great irony and morbid humor. It feels frightening to think that everyone's knowledge of jazz, save the scattershot very few "revolutionaries" (and Seb is definitely not one of them; he seems to hew too close to safety, comfort, and second-guessing), is just second-hand, third-rate, a bastardized recalling of a rich tradition and heritage. (I also had something to say about the fascinating first number, which takes place in the heart of my home turf, the L.A. ghetto — but I talked more about that here: http://www.stanforddaily.com/2016/12/18/la-la-land/ !